Formerly carrying only commercial traffic, the Canal Saint-Martin presents lovers of the capital with an urban landscape unlike any other. With its nine locks, its two swing bridges, its Eiffel-style footbridges, its mysterious vaulted tunnels and its ancient trees, the canal offers an opportunity for strollers to rediscover the Paris of an earlier age. During the Second Empire, significant development fostered by Baron Haussmann transformed the appearance of the canal. Massive public works lowered its level by 6 metres, one section of it, now the boulevard Richard Lenoir, was covered over and the opening of the vault under the Temple created the boulevard Jules-Ferry. In a few short years the area around the canal quickly became increasingly middle-class with the arrival of more prosperous inhabitants and a new generation of artists turning what were once the lofts of artisans into luxury residences. Punctuated by romantic footbridges, a long strip of greenery and mysterious vaulted tunnels, the Canal Saint-Martin is one of the great tourist assets of Paris: freight traffic has given way to river cruises and private pleasure boats, and its banks are now a place for strolls and recreation for the people of Paris. 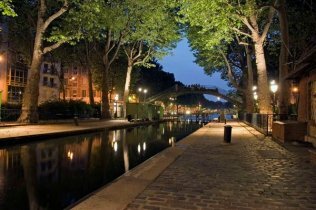 You can book a hotel near the Canal Saint-Martin in the heart of Paris during your stay in the capital. Hotels near Place de la République are also in close proximity to the canal st-Martin. 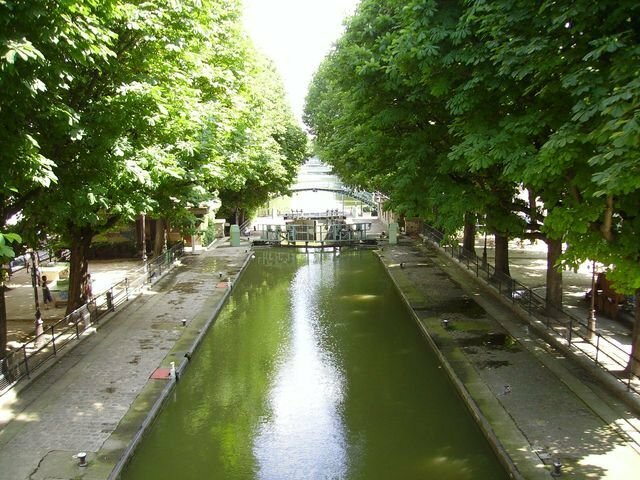 Opt for one of our cruises to discover Vieux Paris on Canal Saint-Martin. A cruise on the Seine River and Canal Saint-Martin will take you directly to Orsay Museum from Bassin de La Villette taking in the Tuileries garden, Louvre, Ile de la Cité and Notre-Dame, then to Canal Saint Martin with a view, among others , of the Hotel du Nord. With the cruise companies Paris Canal and CanauxRama, visitors can enjoy leisurely cruises along the Canal Saint-Martin. There are several cruises featuring the history of the district and unusual anecdotes associated with the canal or passing through the vaulted tunnels and enabling visitors to get to the remarkable attractions of the Parc de la Villette (the Géode, the Cité des Sciences, the Cité de la Musique and the Paris Philharmonie…). Quite apart from the river cruises, the Canal Saint-Martin is an ideal place for dropping into any of the many bars, for strolling along the canal banks fringed with chestnut and plane trees or taking to the cycle paths connecting various places (such as the Bassin de la Villette, the Bastille district and the Port de l'Arsenal…) within Paris or in Seine-Saint-Denis. Be sure to go to the "Hôtel du Nord", a listed historic monument, where the film of the same name by Marcel Carné was made. Looking for other insolit ways to visit Paris? Check our page about the best ways to discover Paris in a short amount of time.